Since 2001, advisory services within the financial services industry have exploded. This trend was magnified after the housing crash and subsequent recession of 2008. More and more people have decided that they need at least some help with managing their finances. Therefore, many people have turned to investment professionals. Broadly speaking, we think this is a good thing. People who become experts in a skill typically perform better than non-experts. While we consider ourselves decent painters and have painted our own home several times, we can spot the work of an expert. That said all professionals aren’t cut from the same cloth. Just as there are quality professionals in any given field, there are questionable professionals and those who simply want to make a quick buck. The financial services industry is highly regulated. This has been the case since the market crash of 1938. After that tumultuous crash and subsequent recession, Congress created the Security & Exchange Commission, better known as the SEC. About that time, two self regulatory bodies, the National Association of Securities Dealers (NASD) and the New York Stock Exchange (NYSE), were formed. These bodies required membership and provided regulatory oversight of brokerages and brokers who had to agree to their rules, regulations and regulatory authority if they wanted to professionally trade stock. No longer could one decide to simply go door to door and sell stocks in publicly traded companies without first obtaining membership and licensing. In July of 2007 and with the approval of the SEC, the NASD and NYSE joined forces and became the Financial Industry Regulatory Authority (FINRA). This unified body allows for more consistent regulations and oversight, which is better for members, member firms and, most importantly, the investing public. One of the many responsibilities of FINRA is to provide oversight of industry professionals, including brokers, broker firms and Registered Investment Advisors (RIA). Passing industry exams, earning various licenses and continuing education are required to claim the title of stock broker or RIA. FINRA’s website, www.Finra.org, offers a tool called BrokerCheck that lets the general public and other industry professionals vet stock brokers and RIAs. This is a great service for anyone who seeks the insight and guidance from financial services professionals. BrokerCheck can be found on the top right corner of FINRA’s home page. Simply submit a financial services professional’s name, their firm or their Central Registration Depository (CRD) number, and FINRA provides a full career history of that professional. A CRD number is provided by FINRA once a person meets minimum licensing requirements to become a member of the industry. Individual brokerage and advisory firms are also assigned CRD numbers. Some of the useful information BrokerCheck provides is a list of the states in which the industry professional is licensed. Each state has unique requirements to sell securities within its borders or to residents within its borders. This lets you know if the person from whom you’re seeking advice is licensed to do so in your state. The information, also, includes the investment professional’s number of years within the industry, any gaps in tenure and the individual’s qualifications. Qualifications include a list of licenses the professional once held and currently holds. Different security types, such as stocks and annuities, require different licenses. Here is where you can learn if your investment professional meets the minimum requirement established by their industry to sell you a particular product or service. BrokerCheck lists the professional’s registration history, which includes all of the brokerage and advisory firms for which they have worked. This is helpful because a professional with a clean record may come from a firm with a poor record. While this doesn’t mean they’re a bad broker, it’s good to have this context about the person with whom you trust your hard-earned dollar. BrokerCheck, also, lists the professional’s outside business activities. This can include outside employment, boards on which the professional serves and places they volunteer. This information helps ensure there’s no conflict of interest between what the professional recommends for you and where their loyalties lay. Most importantly, BrokerCheck lists disclosures. Disclosures are information that FINRA regulators report regarding disciplinary actions or allegations against industry firms and professionals. If someone from the public has made a claim against a professional or their firm of employment, whether valid or invalid, it’s listed here. This is powerful because it puts in your hands a report of experiences other members of the investing public have had with every investment professional and firm. All claims are listed here. The list of possible violations is long, but includes front-running investment transactions, painting the tape, even the appearance of impropriety and selling inappropriate investments or investment plans. Of course, not all claims are fair or accurate. Just as there is the occasional bad brokerage firm, broker or advisor, there is the occasional bad client. We live in a highly litigious society and brokerages and advisory firms have a lot of money. Some clients look for any reason for why they’re due financial compensation. They are rare clients, though. Taken in totality, you can use this information to determine if the person with whom you’re considering investing is reputable. This does not guarantee an outcome of their advice and guidance, but it gives investors some power to understand the relationship in which they may enter. When it comes to your hard earned dollar, it’s worth it. This post was provided by the Debt Free Guys. Check out their blog www.DebtFreeGuys.com and their new eBook #MoneyConscious Financial Planning Guide: 12 Steps to a Richer You. 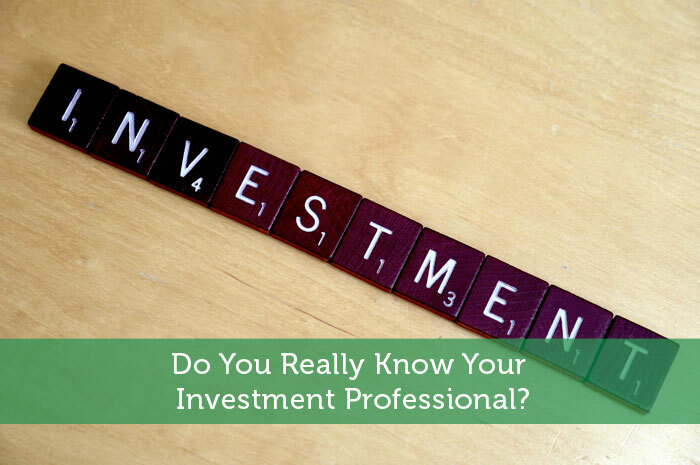 Do You Really Know Your Investment Professional? It’s another learning method on how you Really Know Your Investment Professional. This is very helpful and useful. I learned and many great insights here. Thanks for sharing the article. Great post! This is valuable information for those who don’t have a clue about hiring the right investment professional. Reputation is all that matters. This is valuable information. We should not entrust our hard earned money to the first broker we meet. You’re absolutely right — we should do our own research. Great information. I wish all finance institution websites have a broker check service.